Kim's Savvy Southern Style for Wow Us Wednesday! Thank you so much Kimmie! :) You can see the feature HERE. Okay, I'm still sewing and wanted to share another gift for my little granddaughter I've made. I made a mommy owl pillow with a pocket filled with little owlet triplets. Carter's room is pink and green and I made this pillow to match her room and the closet doors I painted for her a year ago. The snap below is just to remind you of how talented I am! Again, I thought a mommy and babies would be a good thing for Carter since she'll have a new baby brother or sister. She can 'mommy' the little owlets. These two little owlets are waiting their turns for special 'mommy time'. I didn't have a pattern but got lots of inspiration from Pinterest. Don't you love Pinterest? I've been pinning like crazy here lately and the above was my 'aah' to sort of copy. My mommy owl looks like she's having one of those moments, don't you think? I have more little crafts to show you in another post. This is so cute, Sheila! You're so right about Pinterest. It is my go to place for ideas & inspiration. I've been enjoying all your pins. You're driving me crazy with all of your cuteness! I've got to get back to sewing! And look at you....a new cute profile pic! You're hair's longer...I like it! Sweet hugs! I think people will want a whole flock! You sure are talented Shelia, Carter will just love them! So very clever of you, Sheila! You are so stinkin cute! This is darling and matches so perfectly that AMAZING painting job you did - WOWZA!! Now, another piece of fun trivia for you? My daughter married a British boy - and both his parents are, yes, from England. WELL years ago when Dr. John was in residency and working crazy hours, etc, he drove past a broken down band bus and some distraught bandies on their way to a local gig.............and somehow managed to cram them all in his car and got them to the pub in time. The invited him to join them but he had to get back to the lab...........but years later they became mega famous; THE WHO. You are a lean, mean sewing machine! These are wonderful! Your tilda doll is just the cutest and the owls are adorable too you talented lady you!! These are so cute. I love anything with owls, such sweet faces! These are just adorable! You are so amazing that you can just look at things and make your own pattern! What skills! I just know Carter will love playing Mommy with these. The pink decor is lovely. Oh my goodness, Shelia. These are way beyond adorable. You are amazing. Oh Shelia, You are a "HOOT"! I am loving these owls but I too noticed mama looking a little piqued. Oh Shelia, the owls are terrific. Your little one is going to love them. They go so well with that wonderful painted door. What a talented lady you are. Thank you for your comment about my fireplace. I might follow your advice and do a bit of a tour of my home. I have a new quilt for my bed and I haven't shared it yet. I also put a valence in the guest room. I will have fun doing a tour because now I will be motivated to put every room in 'perfect order.' Smile. My computer crashed last night and I am on Bill's computer right now. Yikes, this is not a good thing.We are taking it in today. Very cute ! I am sure your granddaughter will love it ! The owl is so precious with the little babies. I know your granddaughter will go crazy for them. Heck I did too. HA! HA! These are gorgeous Shelia and truly beautifully made. Carter will adore them. Owls are very popular over here too and have been for quite some time. The funny thing though, is that "owls" are my favourite bird. I've had some unbelievable experiences with 'real' owls and those experiences have set them in my heart for all time. I have a small collection of decorative owls and they make me think of these real-life experiences whenever I consciously look at them. I digress - I LOVE your crafty owls! Too cute! You are a talented one! Love the painting you did for Carter. You must be close to number 2 grand baby's birth by now! 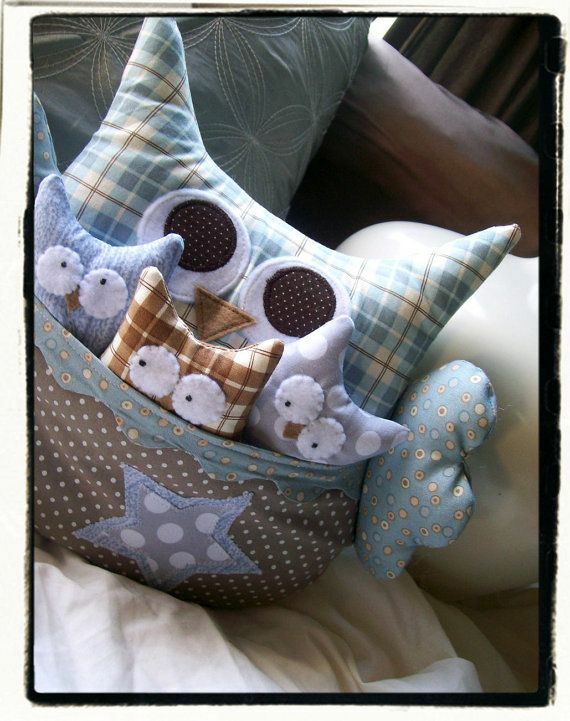 Carter's going to LUV her Mommy & baby owls! Thanks Mommy - they are adorable!!!! Your mama owl and owlets are precious, but I bet that mama is feeling frazzled with triplets!!! You are most talented, dear Shelia! Oh my how cute! You should sell this, adorable! How sweet for your Carter to have the Owl and babies, too! Just adorable!